at the King's Own Royal Regiment Museum, Lancaster. With the generous backing of the Heritage Lottery Fund the King's Own Royal Regiment Museum has been able to acquire an archive relating to one of the regiment's most notable senior officers. Archibald Hunter joined the King's Own in 1874 aged 17, he served in the Egyptian Army from 1884 to 1899, seeing action in the campaigns in the Sudan. He commanded the Egyptian Division at the Battle of Firket in June 1896, and commanded the Flying Column and defeated Devishes at Abu Hamed and occupied Berber in August 1897. In 1898 Hunter, as a Major General, commanded the Egyptian Division at the Battles of Atbara and Omdurman. For his services at Atbara and Omdurman he received the thanks of both Houses of Parliament and was created a Knight Commander of the Bath. In May 1899 he assumed command of the Quetta Division in India, but joined the Natal Field Force in South Africa as Chief-of-Staff to Sir George White VC. He served at the Defence of Ladysmith and, as a Lieutenant General, led remarkably successful drives against the Boers before returning home through illness in January 1901. 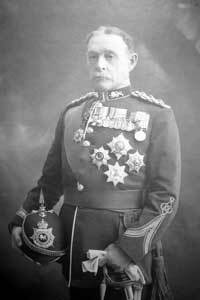 Following commands in Scotland and India, and promotion to General, he became Governor of Gibraltar (1910-13). He was Commander in Chief of Aldershot Command 1914-17 and oversaw the training of the volunteer armies. He was Colonel of the King's Own from 1913 to 1926, Member of Parliament for Lancaster 1918-22 but did not stand for re-election as he 'wished to die an honest man' and a Freeman of the Town from 1899. "Major General Sir Archibald Hunter, the officer to whom the operation was entrusted, was from many points of view the most imposing figure in the Egyptian army. He had served through the Nile Expedition of 1884-5, with some distinction in the Khedive's service. Thenceforward his rise was rapid, even for an Egyptian officer, and in ten years he passed through all the grades from Captain to Major-General. His reputation was not, however, undeserved. Foremost in every action, twice wounded - once at the head of his brigade - always distinguished for valour and conduct, Hunter won the admiration of his comrades and superiors. During the River War he became in spite of his hard severity, the darling of the Egyptian Army." Archibald Hunter died on 26th June 1936, aged 79. The archive acquired by the museum is not a complete collection of Hunter's papers, but clearly one which is formed by the most important documents, in his view, hence their survival. 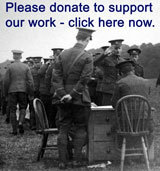 The correspondence with Kitchener illustrates the close working and personal relationship between the two men. 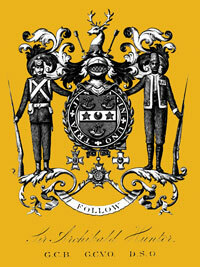 General Sir Archibald Hunter and his Arms. The acquisition of the archive was funded from the museum's acquisition fund, a donation from the Duke of Lancaster's Regiment and a grant from the Heritage Lottery Fund.